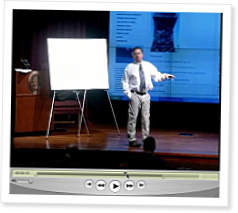 On January 6, 2009, Coach Greg Glassman was invited to give a presentation on CrossFit to over 100 future leaders of our nation’s military from the National War College at the National Defense University’s Baruch Hall. He presented on the same stage where President Bush, Secretary of Defense Bob Gates, and Colin Powell also addressed the students of the National War College. Present in the audience was Lt. Gen. Frances Wilson, President of the National Defense University. In this first part of the speech, Coach Glassman is introduced by Tony Spinosa, Health and Fitness Director for the NDU and former Assistant Strength and Conditioning Coach for the Washington Redskins. The rest of this video is a summary of the first three models of fitness, as presented to an audience of current and future military leaders. An audio only version of this video is available for download also. That was just one 14 minute teaser. Can't wait to hear the rest. Coach Glassman is the most inspiring person I have even had the privilege to watch on my home computer! ha. would be amazing to sit in on a lecture of his in person one day. Cant wait for the rest of the teaser. it stopped right at the important part! Has Coach or anyone else written on the fourth metabolic pathway on the site before? If they have I've completely missed it - very interested! 4th pathway is news to me too. Wow, you learn something new every day on this site. Great talk, can't wait for the rest as well. Where can I find all the papers and studies he's referencing. I'm really curious to read even more in depth on the stuff he's talking about. I'd love to know how well Coach's words were received. Guess we'll find out in part two. Genius is taking the complex and making it so simple it becomes amazing. Coach you're doing a top job! That is so not right giving a teaser. What a great presentation. I also can't wait for the rest. For those who want to read the actual journal articles just do a Pubmed search for Brooks and lactate and you will find numerous articles about this group's research including their most recent finding that neurons (at least in rats) contain similar lactate oxidation complexes as the muscles. Lactate: link between glycolytic and oxidative metabolism. Mitochondrial lactate oxidation complex and an adaptive role for lactate production. This was discussed in the comments of a WOD in 2006(?) but I can't remember which. Have you ever seen the Seinfeld episode where George devises a new plan to end every conversation on a "high note" and "leave them wanting more"? That is this video......Damn, cant wait to see the rest of it!! I wonder if this 4th pathway is why we feel a "second wind" sometimes? I can't wait for the rest of this lecture! Great journal post, great lecture. Thanks CFHQ for sharing. What an exciting event to watch ... ramifications all good on so many levels! Way to go Coach and Staff! Hoorah! All my life, I've been active in sports. As a mom with 4 kids, it got increasingly harder to put in the time at the gym to "stay in shape". I spent so much time doing the cardio/weights dichotomy and with little return. I saw no improvement and really had no goals to push myself besides wanting to lose a few pounds. Glassman's genius has changed my life. I am seeing strength gains, better times, and increased work output overall. And best of all, my body IS changing. He has done so much for fitness and the way we exercise and fuel our bodies. I am ever so grateful. This is another great lecture that gives the academic background and scientific meaning to the puddles of sweat I leave on the gym mats daily. A great introduction piece to anyone that wants to understand the general basis of what CrossFit is designed for. I'm here at NDU and was thrilled to have Coach Glassman here...I've been CF-ing since Jun 08, and I think it's a fabulous program. I had to leave without hearing his presentation because I have a carpool, so I was happy to be able to view it here! Can't wait for the rest! So excited, for everyone of us in the uniformed services, to know that the DoD is beginning to listen and take an interest. For those of you in the military: can you imagine those big Globo type gyms we have being gutted of machines/mirrors/TVs and subsequently re-fitted with barbells, bumper-plates, and pull-up racks? I get teary-eyed just thinking about it. Hopefully, this will signal the death-knell of the recumbent bike. Very interesting, I had not heard of the 4th pathway. I remember watching this and wondering what was going on. I guess we know now. I guess Randy has some huge mitochondria. I need more bring it on. Hi Coach you should have been given this opportunity to give the speech lonnnnggggg time ago for all your great efforts, sacrifices and contributions to the world of fitness. The best is yet to come Coach, Crossfit is simply AWESOME. I searched for Jim Colley and Bruce Evans on google and wasn't able to find anything. They're the guys that Coach said came up with the 10 components of fitness. Does anyone have a link to their work? Or maybe know if I spelled their names incorrectly? The coaches are Bruce Evans and Jim Cawley. Their company is Dynamax, Inc., i.e. the medicine balls we all love to hate. i am totally blown away...Coach, you were phenomenal. your poise...your effectively expressing your point. I can't express how awesome you were.